Britain had eight aircraft carriers in service at the outbreak of World War Two with another six under construction. Of the six carriers in service, the 19,500-ton Ark Royal completed in 1938 was the largest and most modern. The first four of the new carriers were the 23,000-ton Illustrious class, all with 5-inch armored decks. These carriers were commissioned between 1940 and 1941. The two Implacable class ships were fitted with four engines and propellers rather than the triple propulsion systems that powered the previous four Illustrious class and Ark Royal. Implacable’s sister ship Indefatigable was built at John Browns of Clydebank, this yard being only a few miles from the Fairfield yard in Govan. Although the construction of Indefatigable began nine months later, she entered service three months before Implacable. Indefatigable’s first deployment after joining the British Home Fleet in July 1944 was to search for German warships based along the Norwegian coast. Theses warships including Bismarck’s sister ship Tirpitz were being used to attack supply convoys traveling between Britain and Russia. After Norwegian intelligence reports stated Tirpitz was based at the Alten Fjord/Northern Norway, aircraft from Indefatigable were used to attack Tirpitz on the 22nd, 24th and 29th August 1944. Although Tirpitz survived these attacks, British long range Lancaster bombers sank her with 13,000 lb bombs November 12th 1944. 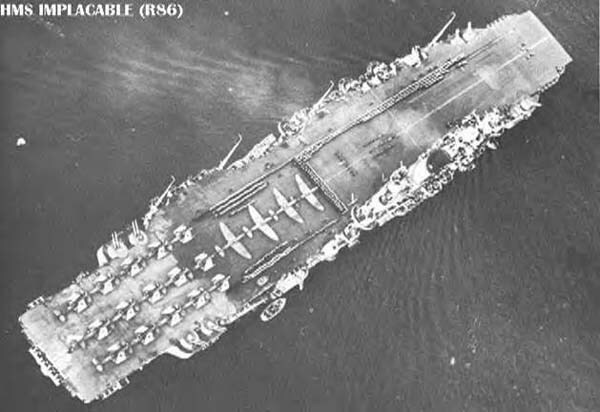 Indefatigable was relocated to the British Pacific Fleet after Implacable joined the Home Fleet in September 1944. Indefatigable first saw action in the Pacific at the Indonesian Islands and Ryukyu Islands. The later being where she became the first British ship to be hit by a kamikaze. After Implacable joined the Pacific Fleet in July 1945, she was operated alongside her sister ship carrying out attacks on the Japanese Home Islands until the end of the Pacific War August 14th 1945. Indefatigable arrived back in the UK March 15th 1946 and Implacable June 3rd 1946. Both ships were unable to operate the new larger aircraft entering service after the war as they had been designed with hangers only 14 feet in height. This meant they were only suitable to serve as deck landing training ships. After long periods of inactivity and being used as a training ship, Implacable was scrapped at Inverkeithing/Scotland in 1955. Indefatigable also served as a training ship before being scrapped at Dalmuir and Troon/Scotland in 1956. The four Illustrious class carriers all served with the British Home Fleet before joining the Pacific Fleet in 1944. Illustrious was scrapped in 1956, Indomidable 1955, Formidable 1956 and Victorious 1969. Britain had 14 aircraft carriers during WWII that entered service between 1918 and 1944, 5 were sunk such as: Courageous by U-29 September 1939, Glorious by the German battleships Scharnhorst and Gneisenau June 1940, Ark Royal by U-81 Nov 1941, Hermes by Japanese aircraft from the carriers Soryu, Hiryu and Akagi April 1942, and Eagle by U-73 Aug 1942. Britain had 20 other aircraft carriers under construction during WWII that could not be completed in time for the war. They ranged from 18,000 - 36,000 tons. List of British aircraft carriers. Below, HMS Victorious after being fitted with an angled flight deck post WWII.